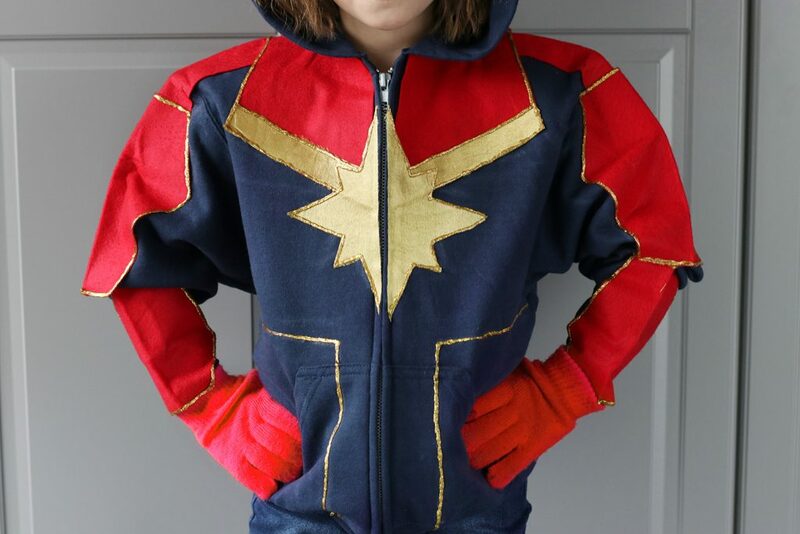 Get ready for the next installment of the Marvel Cinematic Universe with proper girl power swagger. 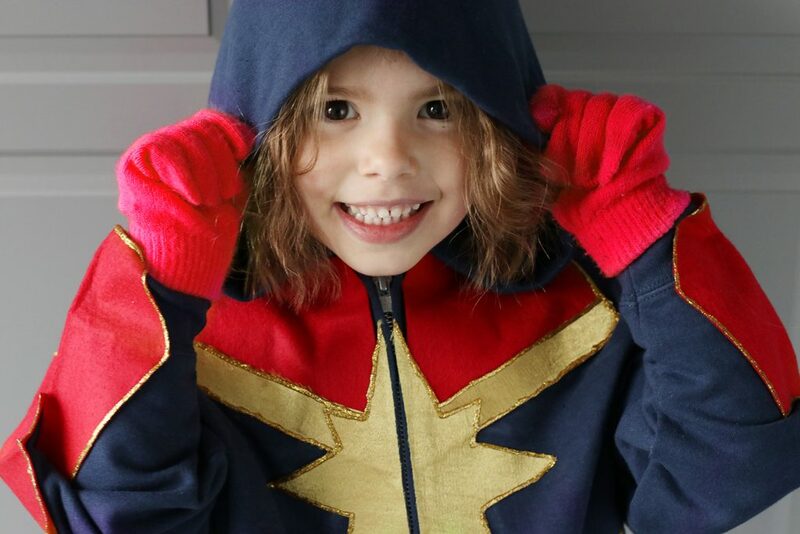 Hood up for the show with this DIY no-sew sweatshirt modeled after the soon-to-be new favorite superhero, Captain Marvel. It may not give you her superhuman strength but it will help you blast away those winter blues! She’ll be hitting the big screen on March 8th and if you are as pumped as we are about the premiere, then maybe this DIY is for you. If you need an introduction, watch and be transported to the edge of your seat. Also, be transported back to the 90’s when the movie takes place. We love anything retro. It’s always fun to relive the pop culture of the past through cinema. Maybe we’ll get a chance to see why Captain Marvel hasn’t been around while the rest of the Avengers and Guardians of the Galaxy have been going through their own issues! This post was written, created and shot by Tara at Spot of Tea Designs. Click that link for more of her DIY projects! 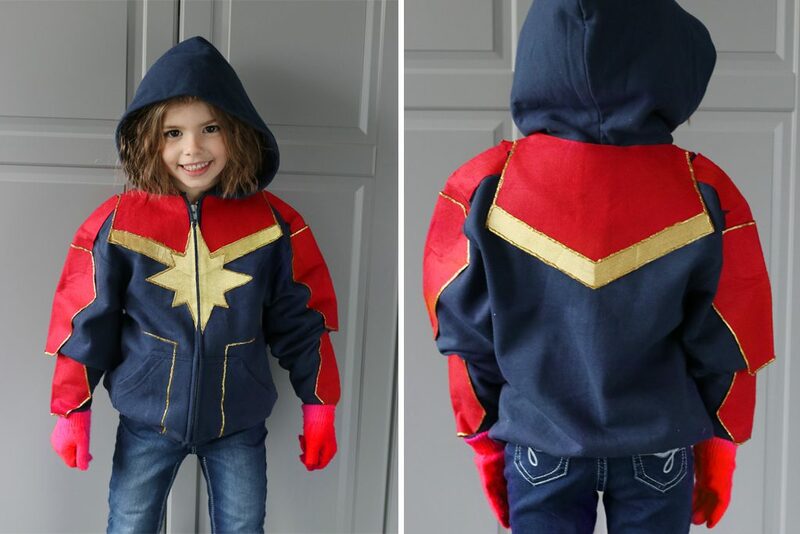 See how to transform this basic hoodie into a battlesuit fit for Carol Danvers with the help of some no-sew techniques, red and gold fabric and some puffy glitter fabric paint. First cut out the Captain Marvel template pieces. 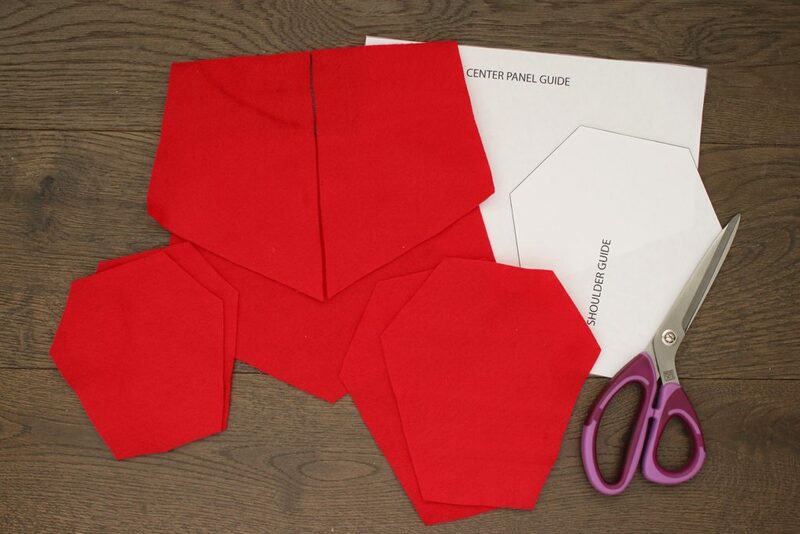 Trace the following on red fabric: 2 shoulder pieces, 2 center panels, and 2 sleeve pieces. Trace the following on gold fabric: center star. 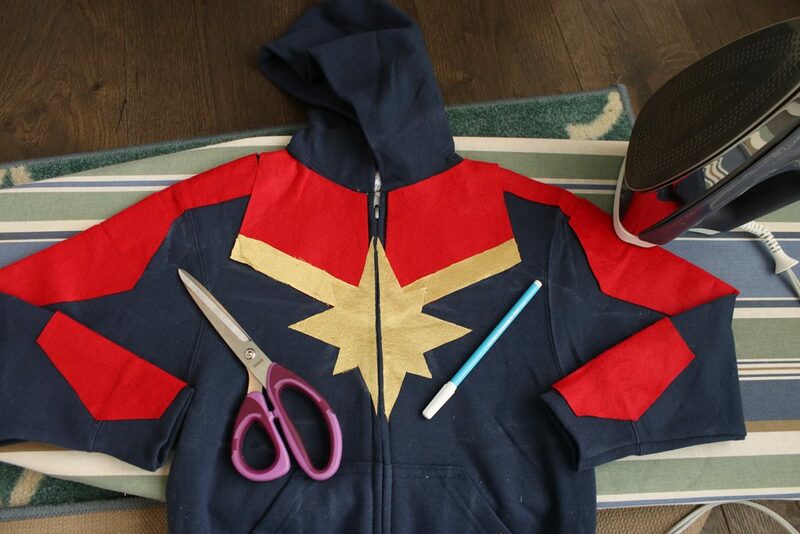 Note: Additional pieces will need to be cut for other parts but are based on your hoodie size. All these shapes on our template are just a guide as you may need more room on different sides, depending on the size of your hoodie. Next, cut and adhere rectangular shapes to cover the top shoulders of the hoodie using the heat n bond and your iron. 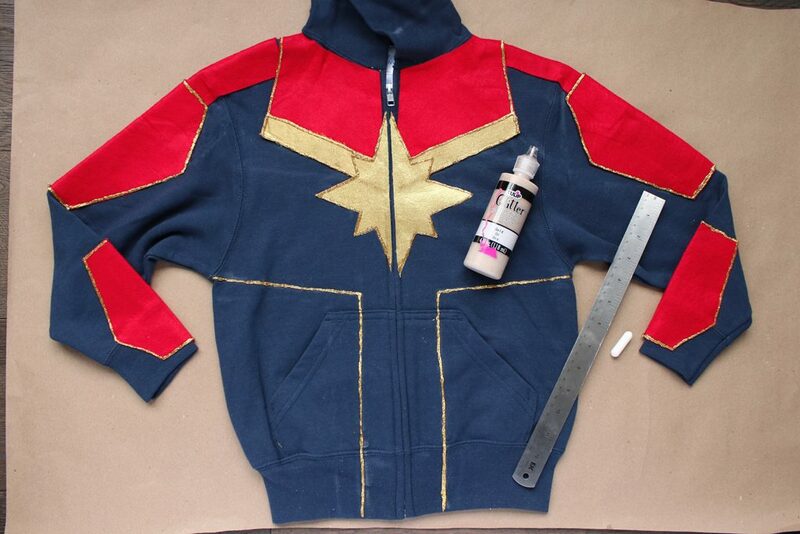 Aslo adhere the center panel pieces to the front of the hoodie. 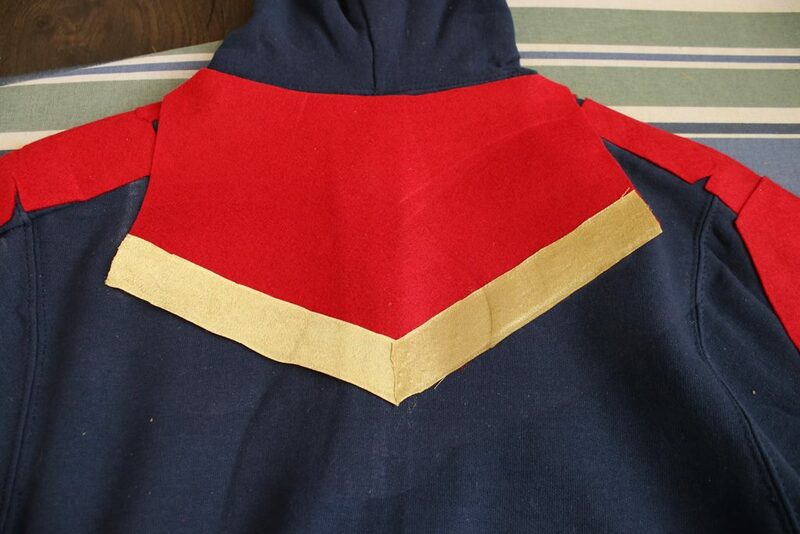 Cut long pieces of gold fabric about an inch wide to adhere over the bottom of the center panel, as shown. 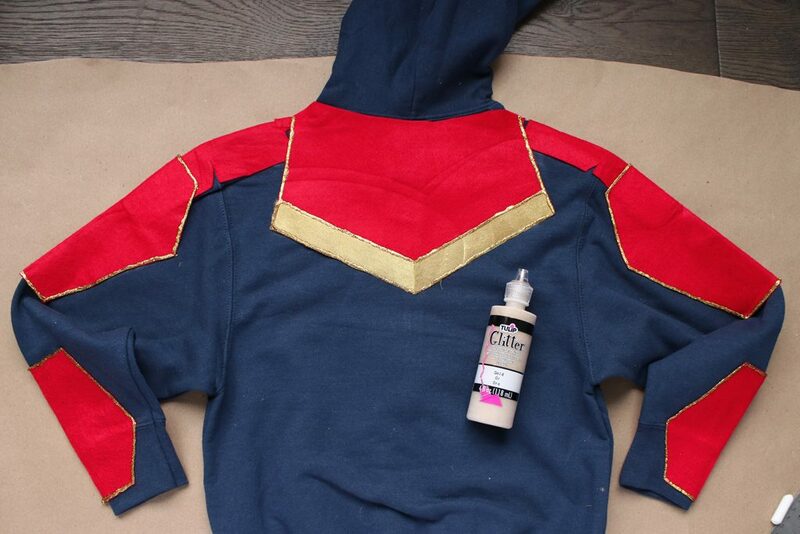 Adhere the shoulder panels and sleeve panels onto the hoodie, as shown. 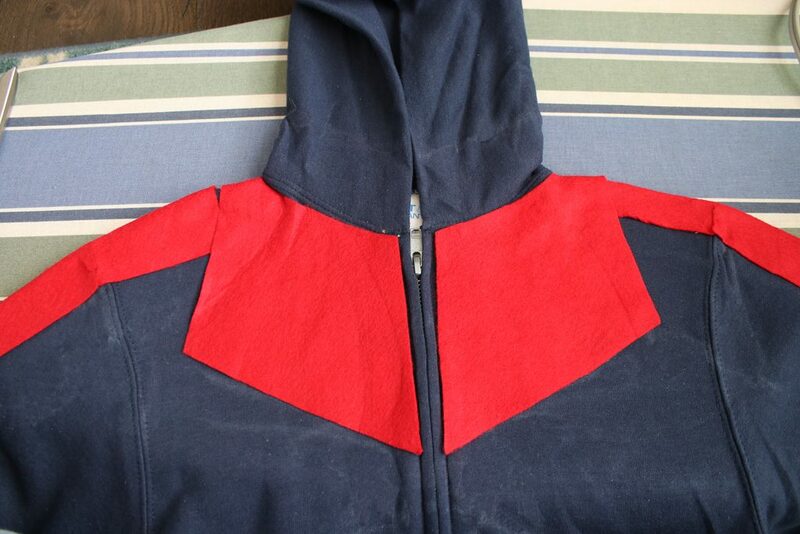 Flip the hoodie over and adhere the red center panel on the back. Also add another border of gold fabric to create the “V”. Apply gold glitter puffy fabric paint along the edges of all the panel shapes. 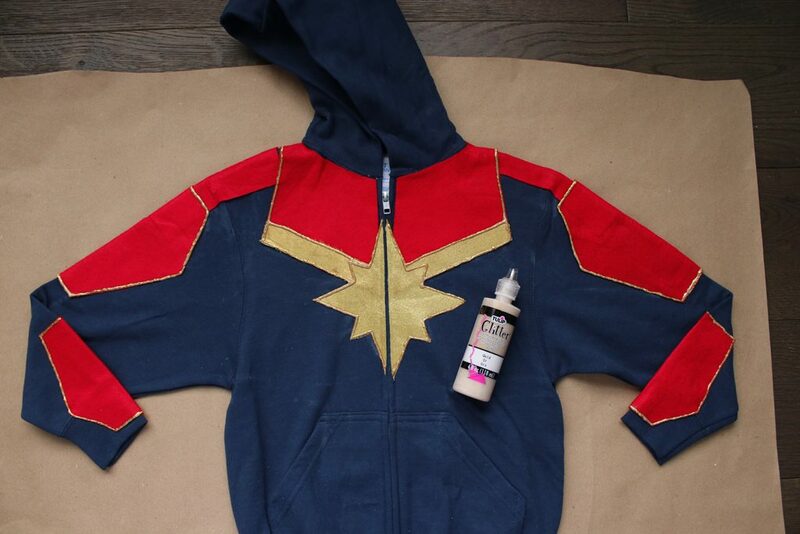 Use chalk to draw additional lines on the front of the hoodie to mimic Captain Marvel’s fitted suit then go over them with the gold puffy paint. Allow this to dry completely according to the bottle package directions. Ours listed at least 4 hours. 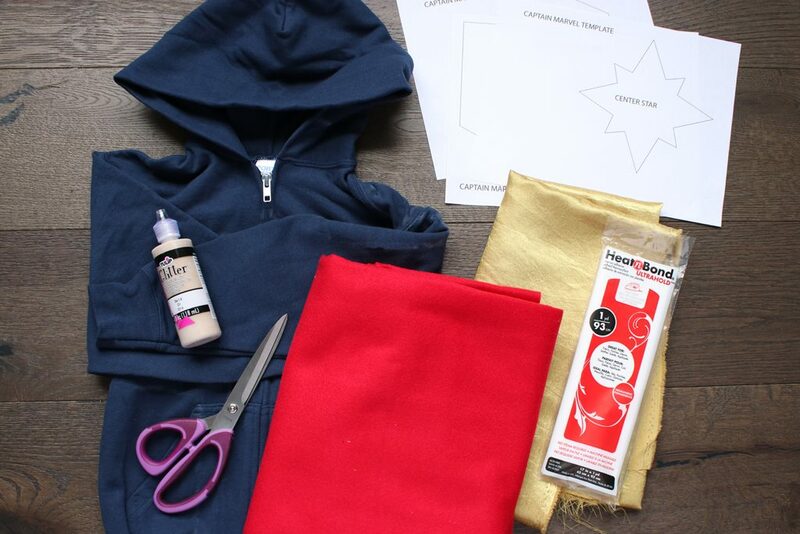 Flip the hoodie over to the back and repeat the steps to outline the panels using the gold glitter paint. Allow the paint to dry as directed. Now you’re ready to show off some super human strength! 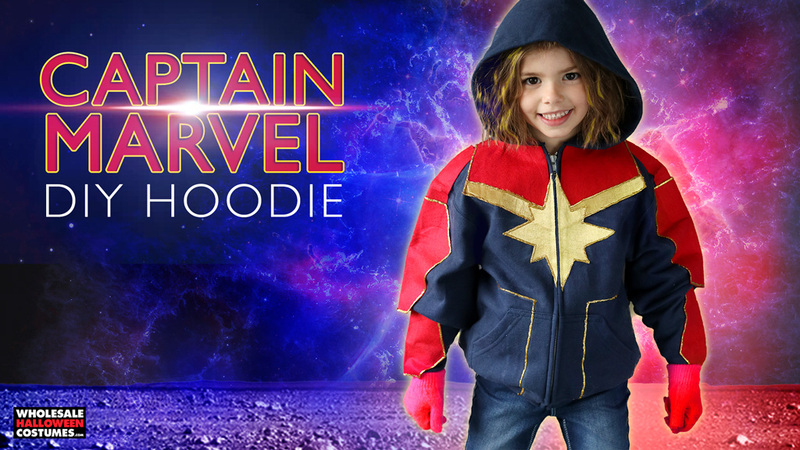 Pair this hoodie with Captain Marvel gloves to make the transformation into Carol Danvers complete! 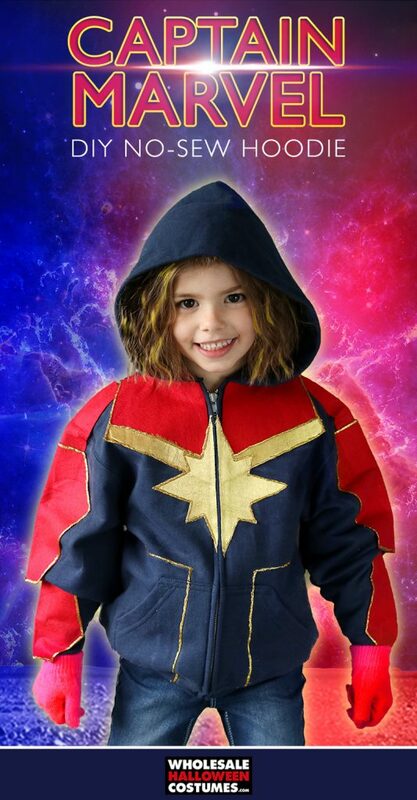 Looking for Captain Marvel Costumes or maybe you’d prefer to browse all of the Costumes of the Marvel Universe, we’ve got you covered on WholesaleHalloweenCostumes.com. If this tutorial is next on your to-do list please be sure to snap a pic and share it with us on Facebook, Twitter, or Instagram! We share all our fave ideas on Pinterest too!